I thought I would update my blog with some life updates, some things I have been doing or not been doing and just generally how my life is going down in Indianapolis, Indiana. The American dream isn't going as smoothly as I would have liked but then, most dreams don't go the way you want them to go. This recent discontent has come about due to the fact that I am having a hard time trying to get into teaching. Having graduated in American studies and having a great passion for American history, I have applied for various volunteer positions or simply gone into some schools/universities and inquired about jobs. This has had no avail to my current situation which is leaving me very stressed and dysfunctional. One of my biggest passions is kids and one of my biggest beliefs is in education and right now I am trying hard to put them two together for my career. BP has finally stopped the oil spill after 3 months. Good for them. I still happen to be using BP when i'm filling up the car and not noticed a slant in their prices however, being a Brit, Americans have asked me what I think of them. I understand the oil spill was an accident but it simply doesn't seem good enough that a giant oil company like BP could take 3 months to clear this up. Anyone blaming Obama is either a Republican or an expert on oil cleanup programs. Sure the man is in charge but BP is responsible for the problem and is responsible for the cleanup - a task that is not so simple. Also while i'm in a discontent mood, I feel it is an interesting subject to discuss the shootings that happened 2 nights ago here in Indianapolis. Every year there is an event called the Black Expo Summer Celebrations. It is a celebration of African American Culture in the form of bands, entertainers, services, preaching, food etc. It is the one event in Indy that I am constantly reminded to stay away from simply because "If you want to get shot Adrian, go downtown during the expo." Of course this is a little exaggerated and I even did go downtown last year during the expo. Being white, you are the minority obviously in an African American event but I had no problem. Two nights ago TEN people were shot during the event. Although there were no fatalities, all the victims were aged between 10-19 and were all boys. I couldn't believe that ten people could be shot during what is meant to be a celebration. More over, 500 police officers were out on the streets sat night and the shooter wasn't caught. I just cannot believe that this happened. I feel the white people of Indy constantly are looking on and waiting for black people to screw up. I can't tell you how disappointed I was that Sat night gave these people the perfect excuse to try and justify their argument. I know in any event a few bad apples can ruin the lot and this is what has happened but it saddened me that whoever the shooter(s) was, he/she should be ashamed for all the progress the Expo is trying to make and just how quickly all that progress was shattered sat night. On a lighter note and a lesser rant, I purchased a bike sat from Walmart. 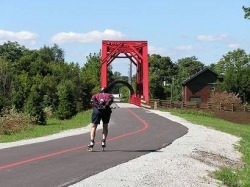 My reason for doing this was that not far from where I live is the Monon trail. Anyone in Indy will know what this is but basically it is a trail 16 miles long and just for bikes, runners etc. It is fantastic and a great way to exercise, see Indy and have fun. I thouroughly enjoyed biking Sat afternoon in the sun. Lastly, Fri night last week I went and watched a movie called Inception at the theatre. By now there probably won't be a person left who hasn't heard the hype about how awesome this movie really is but if there is someone reading my blog who has escaped the sky high reviews and commercials and word of mouth..................go watch it because it really is one of the best movies I have ever seen.